The only woman ever to be commissioned City Printer of Philadelphia (ca. 1810 to 1850), Lydia Bailey took over her husband's printing business -- and its many debts -- upon his death in 1808, in an effort to support herself and their four children. Unlike many widows and daughters of printers, Lydia Bailey not only ran the business but actually learned to set type herself, and claimed that she instructed "forty-two young men, including some of the city’s future master printers, in the typographic arts." Her career spanned more than half a century, and she died in Philadelphia at the age of ninety. 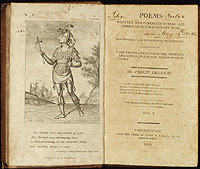 Poems Written and Published During the American Revolutionary War, by Philip Freneau. 3d ed., in two volumes. Philadelphia: From the press of Lydia R. Bailey, 1809. Zion's Pilgrim, by Robert Hawker. First American ed., improved and enlarged, Philadelphia: Published by James Martin, 1809. Lydia R. Bailey, Printer.